Heater, Oxygen Mask, Electric, Type E-1, 24 volt. Manufactured by General Electric. 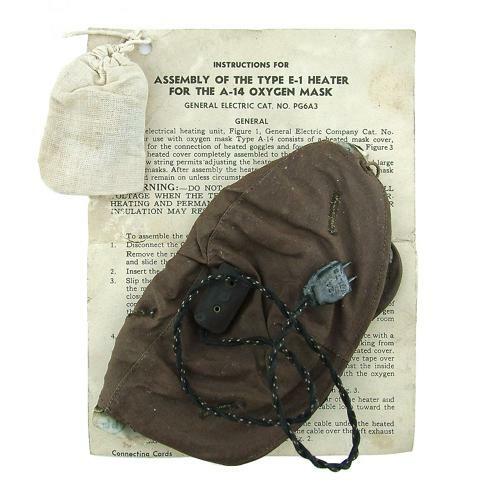 Brown cotton mask cover with integral heated wiring element to prevent ice forming on the exhilation valve of the type A-14 oxygen mask. A 2-pin plug connected the heater to the F-2 or F-3 jacket. A little dusty and with age related wear but in very good condition. Probably unused. Comes with instruction leaflet and small cotton bag containing four spare plastic rivets. Stock code O23229.